... 1988, Steffi Graf, the tennis sensation born 19 years earlier in Mannheim, Germany, defeated "her teen-age contemporary, Gabriela Sabatini of Argentina, 6-3, 3-6, 6-1," in the U.S. Open. She thus became the 1st woman in 18 years (and the last since) to win tennis' Grand Slam, having already beaten opponents that year in the Australian Open, the French Open and Wimbledon. 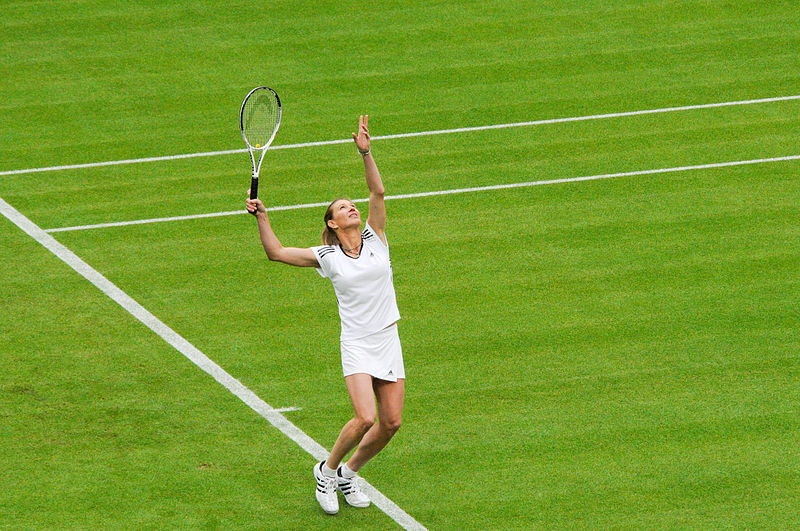 (credit for 2009 photo of Graf at that London site) Later in the year, she'd win what the media dubbed the "Golden Slam" when she added an Olympic gold medal to the list. She stood alone in that achievement till last month's London Olympics, when American Serena Williams completed her 2012 sweep of all 5 tournaments.